1. Preparation of an alkene via dehydration (removal of water) of an alcohol in the existence of an acid catalyst. 2. Computation of percentage revival of product. Dehydration is a removal reaction of an alcohol. The elimination reaction occupies the loss of an OH from one carbon and an H from an adjacent carbon. In general, this amounts to the elimination of a molecule of water, resulting in a pi-bond formation of an alkene or alkyne. The loss of water from a molecule is termed dehydration. In many cases alcohol dehydration needs an acid catalyst and heat. Phosphoric acid (H3PO4) and sulphuric acid (H2SO4) are the most usually utilized acid catalysts. Whenever more than one elimination invention can be shaped, the main product is the more substituted alkene - the 1 attained via removing a proton from the adjacent carbon which has fewer kinds of hydrogen (Recall Zaitsev's rule). The more substituted alkene is the major product since it is the more constant alkene, so it has the more steady change state leading to its structure. To prevent the alkene shaped in the dehydration reaction from reforming back the alcohol, the alkene can be eliminated via distillation as it is formed, since it has a much lower boiling point than the alcohol. Removing a product moves the reaction to the right. (Recall Le-Chatelier's principle). Since the OH group is a extremely poor leaving group, an alcohol is able to undergo dehydration only if its OH group is converted into a better leaving group. One way to convert an OH group into a good group is to protonate it. In the 2nd step, water departs, leaving behind a carbocation. In the third step, the base HSO4- eliminates a proton from the carbon adjacent to the completely accused carbon, forming an alkene and regenerating the acid catalyst H2SO4. Since the cyclohexene has lower boiling point than the cyclohexanol, the cyclohexene can be distilled as it figures. Phosphoric acid (the catalyst) is left in the distilling flask since of their high boiling points (161oC and 213oC, correspondingly). Though, because a small amount of phosphoric acid still shows in the receiving flask, the product is cleaned through aqueous sodium carbonate to neutralize the acid. Cyclohexene is insoluble in water and therefore isn't lost throughout the washing via aqueous sodium carbonate solution. The last traces of water are eliminated from the crude cyclohexene using anhydrous sodium sulphate (a salt that forms a hydrate). Step I - Compute 10 mL of cyclohexanol into 50.0 mL round-bottom lask. Watchfully add 3 mL of 85% phosphoric acid; H3PO4, the boiling chips, and mount the flask for easy distillation (Figure: either utilize column packing or low hold-up packing). Gradually heat the mixture until it approaches to a gentle boil. 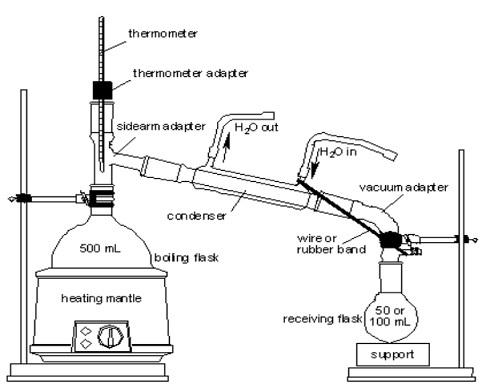 After 10 minutes of gentle boiling, amplify the heat adequately to cause distillation (the temperature of the distilling vapor should not exceed 100oC) and gather the distillate in a cooled 25 mL round bottom flask as a receiver. To the distillate, adjoin 1 mL of 10% sodium carbonate solution, Na2CO3, to neutralize any traces of acid, that contain being carried over. Move the liquid to a separatory funnel, adjoin 5 ml of cold water, swirl the mixture gently, and drain off the lower aqueous layer. Pour the upper organic layer into a small, dry 50 mL Erlenmeyer flask, and dry it over anhydrous calcium chloride (add about on tea spoon) for five - ten minutes through a cover. Step II (request instructor if needed) - Pour the dried cyclohexene into a little distilling flask, add a boiling stone, connect the flask to an easy distillation meeting, and distill carefully. Bring together the material distilling at 80 - 85oC. Compute the weight of the product and determine the percentage yield. Step III - Utilize five-ten drops of product in 2 tiny test tubes and test through drop-wise bromine (decolouration) and drop-wise potassium permanganate (dark brown precipitate) for purity and identification of alkene.